In a recent revision (Soleglad & Sissom, 2001), the family Scorpiopidae and the chactid genus Chactopsis were included into the Euscorpiidae. This was done after a very thorough phylogenetic analysis of the two families. After the revision, this family now includes 12 genera and 143 species [Updated 03.08.18]. Euscorpiidae are widespread in central and southern Europe, and also found in Africa (Mediterranean coast), North America (Mexico), Central America (Guatemala), South America (Brazil, Peru, Venezuela), Asia (west, central, south and southeast). One species has become established in some parts of southern England. The forefathers of these scorpions probably came with merchandise to the harbors, and have succeeded in surviving in sheltered places. 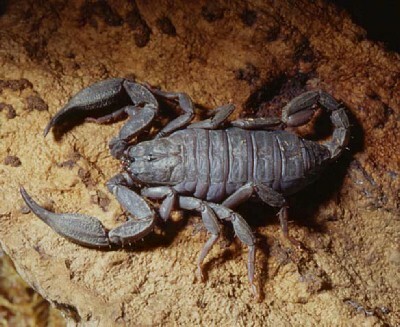 Some species of this family have been reported in captivity, especially members of the genus Euscorpius. 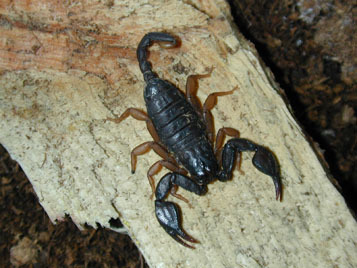 Some members of the genus Scorpiops have been reported to occur in captivity, but many of these might be misidentified members of the scorpionid genus Heterometrus. The members of the genus Euscorpius are under taxonomic investigations by professor Victor Fet and other scientists. Several important changes are expected, and these will be published in The Scorpion Files as soon as they are official. Online identification key for the Euscorpius genus. The key includes most of the recently described species. Euscorpiids are harmless scorpions which possess no threat to healthy humans. Some habitat pictures for E. carpathicus in Italy. Some habitat pictures for E. flavicaudis in England. Soleglad, M. E. & Sissom, W. D. 2001: Phylogeny of the family Euscorpiidae Laurie, 1896: a major revision. 25-111. In V. Fet & P. A. Selden (eds.). Scorpions 2001. In memoriam Gary A. Polis. British Arachnological Society. Burnham Beeches, Bucks. xi + 404 pp. Genus Chactopsis has been transfered back to Chactidae based on the decisions in Lourenco, 2003 and Lourenco et al., 2011. Thanks to Dr. Victor Fet and Dr. Benjamin Gantenbein for keeping me updated on Euscorpius taxonomy! Euscorpius flavicaudis photo (left) by Jan Ove Rein (C).